Athletes approach the end of a 400 m track race in San Diego. Athletics, or Track and Field, is an Olympic sport where athletes compete in a range of events involving running, jumping and throwing. Athletics has been at the centre of the Olympics since the modern games were inaugurated in 1896, and in the present day has more medals to be won than any other sport. Athletics is an important sport at schools and colleges in the United States, and as a result America is one of the most successful nations in track and field. In a school or college context, the term 'athletics' is also sometimes used to refer to all sports, rather than just track and field. Although athletics is considered a single sport, different events require very different attributes. For example, sprint events (100 m and 200 m) require explosive power, whereas distance events (5000 m and above) require stamina and tactical awareness. Hurdling events, triple jump and pole vault require exact technique as well as speed, strength and flexibility. It is common for certain countries to specialise in one area of athletics, for example Jamaica (sprinting) and Kenya (distance running). Because of the differences between events, it is rare for athletes at the highest level to compete in multiple disciplines, except for established 'doubles' such as the 100 m and 200 m, or the 800 m and 1500 m. Exceptions to this are the multi-event competitions of decathlon and heptathlon, which are designed to reward the best all-round athletes. Gold medallists in these events have a strong claim to be the best athletes in the world. All athletics events require a high level of dedication and determination to complete the training that is a prerequisite for success. In the mid-twentieth century, women competed in far fewer events than men. Gradually, women have been allowed to do more and more, until in the 2008 Olympics in Beijing the only differences were running 100 m rather than 110 m in the sprint hurdles, and competing in the heptathlon rather than the decathlon (the women's shot, discus, javelin and hammer are also lighter than the men's). Some of the last events to be added were pole vault, hammer and steeplechase. In running and hurdles events, multiple competitors race each other at the same time, and the winner is the one who completes the specified distance quickest. 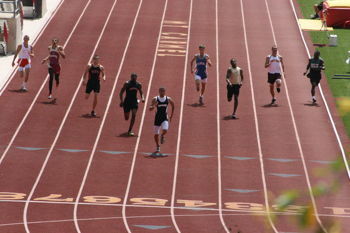 The number of competitors in shorter events (up to 800 m) is limited to the number of lanes on the track (usually eight), so more than one round may be needed. In throwing events, long jump and triple jump, athletes compete one at a time. Each has a number of attempts (usually six), and counts their longest distance only. The person who throws or jumps the furthest in a single attempt is the winner. In high jump and pole vault, the bar is placed at increasing heights, and athletes can choose to pass or attempt to clear each height. Those who fail three attempts in a row are out of the contest, and the winner is the person who clears the highest height. In the event of a tie, the winner is the jumper with fewest failed attempts over the course of the contest. Like any sport that relies heavily on purely physical attributes such as power and speed, the sport of athletics has to be vigilant for the use of performance-enhancing drugs (doping). Because of its high profile, athletics has had some of the most publicised doping scandals of any sport. These include Canadian sprinter Ben Johnson's positive test for steroids at the Seoul Olympics in 1988, and the more recent stripping of Marion Jones' gold medals after she admitted having used performance enhancers. During the Cold War, success in sport and particularly in athletics was seen as important for American and Soviet prestige. This led to systematic doping in the 1970s and 1980s, particularly by East German female athletes, although the true extent of drug use during that period may never be known. Decathlon, where men compete in ten separate events over two days. Heptathlon, the women's equivalent, which features seven events. This page was last modified on 10 January 2009, at 16:00.